You are at:Home»Graduate Careers»REVEALED: What are the Worst Paying Degrees? What subject you studied at university isn’t the be all and end all, and it certainly doesn’t have to define your future career. It may, however, have a considerable impact on your future earnings. Five years after graduation, we can see a clear income gap between the best and worst paying degrees. Medicine and dentistry graduates are earning £46,700 on average, whereas arts and design grads receive less than half that, with £20,100 being the average. Additionally, as careers continue to progress the pay gap only gets bigger with the top-end subjects continuing to pull away from those at the bottom. See the complete table with data from the Institue for Fiscal Studies report below. Gender. One year after graduation men are earning 8% (£1,500) more than women on average and this increases to 14% (£3,500) after five years. Social background. There’s a 10% pay gap between rich and poor graduates with the same grade from the same course. University. 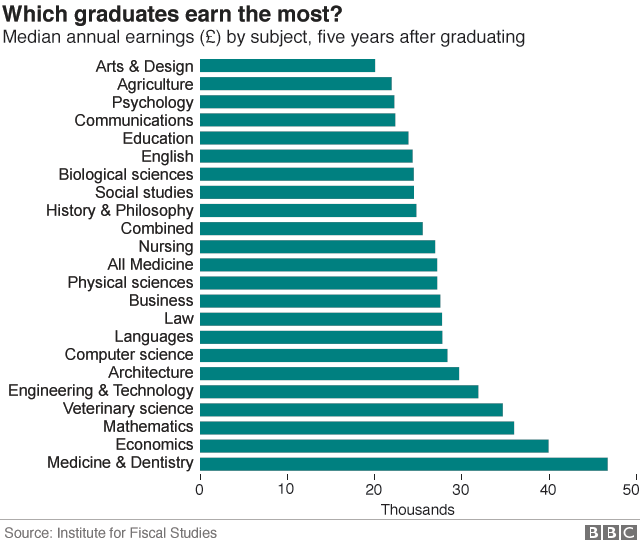 Russell Group graduates earn an average of £33,500 five years after graduation – about 40% more than those who studied at other universities. On the whole, just having a degree is going to boost your salary potential. Women can expect to earn £250,000 more over their lifetime with a degree, while male graduates will benefit earning around £170,000 more. Salary isn’t the only thing you should focus on in your career though. Finding a role that you are passionate about, enjoy and that offers a good work/life balance is also important. Are you looking for a graduate job? Upload your CV to JobsGraduate today, allowing you to be searched by thousands of potential recruiters and employers!